Spoil your loved one with our Glittering Gold Arrangement. 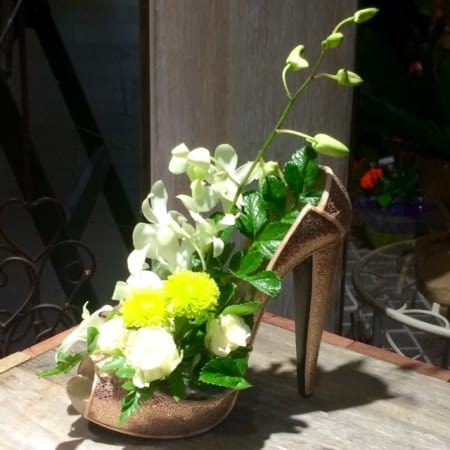 Perfect for the Stiletto lover in your life, this gorgeous arrangement is presented in a high heel shoe. Colour of shoe and flower design will vary. After finishing with your fresh flower arrangement, reuse your floral shoe base as a phone holder, wine bottle holder, or bring it back in for a new arrangement. Get in fast while stock lasts. Glittering Gold Arrangement from Amaranthine Flowers By Design. Your local florist in New Lambton, Newcastle.